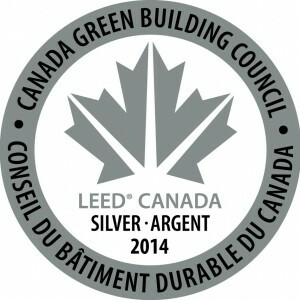 We’re an environmentally sustainable building, with LEED™ Silver design standards. Sustainable buildings minimize their impact on the environment from design through to construction, to operations and maintenance. The Canada Games Centre is built on a lot that was previously used as a dumping ground for waste concrete and asphalt. Prior to construction, the site underwent an environmental assessment and was cleaned to meet current environment and health standards. There are enough bike racks installed on site for over 5% of the regular building occupants. We’re located near a bus stop which services several routes. For those who do need to drive, parking spots reserved for carpools are available near the building. The washrooms were designed with water efficiency in mind. Included are low-flow faucets and showers, dual-flush toilets, and waterless urinals. The toilets do not use city water, but instead use rainwater collected from the roof. A waterless urinal has no flowing water or flushing mechanism, but instead uses a non-toxic chemical in the trap. A public washroom has the potential to use very large amounts of water. The use of water-efficient and waterless fixtures instead of conventional ones reduces the demand for municipal water by more than 30%. Rainwater from the roof is collected and stored in a cistern. A cistern is a large water-tight container built to catch and store water. The collected water is used to irrigate the baseball field. Rainwater is also used as toilet water. Water for such purposes as baseball field irrigation and toilet flushing do not require any extensive treatment. Using rainwater reduces the amount of city water used, and doesn’t waste the highly treated city water for purposes that do not need water to be of drinkable quality. A high efficiency dehumidifier is a key piece of equipment in a pool environment as the area is quite humid. This dehumidifier also helps to warm the pool water by recycling heat from the air. A dehumidifier works by cooling warm pool air. Cooler air does not hold as much moisture as warm air, so the water in the air condenses, and is drained back to the pool. Each of the air handling units in the Canada Games Centre utilizes heat recovery. The fresh air entering the building is pre-heated or pre-cooled by the exhaust air leaving the building. These processes are accomplished without mixing the air streams. Air handling units utilize heat pipes. These devices contain a refrigerant that transfers the heat from one air stream to the other. Heat pumps are used for both heating and cooling individual rooms and spaces. The heat pumps are activated by motion sensors to help reduce energy waste in vacant areas. Natural gas high-efficiency boilers are used to supply hot water for the building. Many of the boilers used in HRM today are oil fuelled. Natural gas is better for the environment than oil, and is considered to be one of the cleanest burning fossil fuels. These boilers have an efficiency of more than 90%, versus a typical new oil boiler efficiency of around 85%. There are 200 solar panels on our roof. These panels are used to heat domestic water for purposes like showers and sinks. There are also solar duct heaters on the roof. These preheat ventilation air which goes to the Field House. This helps to reduce the energy load and cost of heating the large Field House. All refrigerants used at the Canada Games Centre are HCFC-free, using alternatives which do not deplete ozone. This building is equipped with an Energy Management and Controls System (EMCS). This system has the capability of controlling the lighting, ventilation, heating, and other systems. The system gives operators the ability to schedule when equipment should operate. This building is also equipped with motion sensors to detect occupancy. Systems like ventilation and heating run at a minimum level when the area is unoccupied to conserve energy. Operators can also control systems remotely. The EMCS will also log and trend the data it receives. This will allow operators to more easily detect and diagnose problems, as well as find more efficient ways of running the system in the future. The Canada Games Centre was built, in part, from recycled material. In fact, over 15% of the construction material is post-consumer or post-industrial recycled content. This value does not include any mechanical or electrical components. Rock that was excavated from the site was crushed and used for fill during construction. Waste concrete and asphalt that was left behind on the site was also recycled. Other recycled material that was brought on site includes, structural steel, gypsum board, and window glass. Using recycled materials reduces the impacts from extracting and processing new materials, as industrial and manufacturing processes are often very energy intensive, and therefore produce large amounts of greenhouse gas emissions. Green education – we’ve placed panels around the building which outline the key design features from each of these categories. We have a Green Housekeeping Policy to reduce the exposure of patrons and staff to potentially hazardous chemical, biological and particle contaminants and procedures, which could adversely affect human health, building finishes, building systems and the environment, indoors and outdoors. Policy components include: sustainable cleaning products and chemicals, chemical dilution control system, cleaning equipment and indoor air quality (IAQ), miscellaneous supplies and hand soap (not containing antimicrobial agents), training, staffing and communication. Daylighting is the process of using windows and/or skylights to allow natural light to be used to replace some or all of the electric lighting requirements. The window size, location and materials are all optimized to provide the ideal amount and brightness of light, while preventing excessive heat loss through the windows during the cold months. Orientation of the building and its components is also considered to maximize daylighting efficiency. The tinted and frosted glass you see is not just decorative. It helps control the amount of light which enters and prevents glare that can be hard on your eyes. Daylighting creates a more comfortable and enjoyable place to work and play. Also, because of the amount of natural light which enters the building, the load on artificial electric lighting is reduced. Many people are familiar with the smell of a new car or building. This scent is a result of Volatile Organic Compounds (VOCs) being emitted from some of the construction material. At the Canada Games Centre, low-VOC alternatives to conventional adhesives/sealants, paints/coatings, carpet and composite wood have been selected. For example, composite wood on-site cannot contain any urea-formaldehyde. These products had VOCs below a certain level in order to be installed in the facility. These measures will improve indoor air quality, and reduce the amount of contaminants in the building which could potentially be irritating and/or harmful to the installers and occupants. We are a scent aware facility and posters are placed throughout the facility.